Right now and through the month of April, we're exploring all things earth science in the BOOMbox. That means rocks, natural disasters, ecosystems... all sorts of exciting natural phenomena that are ripe for exploration. One of the hits of the BOOMbox: Earth rotation thus far has been our weekly Monday afternoon microworkshop on volcanos. Who doesn't love a good eruption? You can find the basics of the microworkshop on the help site for the BOOMbox (click here). And if you want to make your very own volcano, just like ours? Well, lucky you--here's a video that shows you how to do just that, complete with elephant toothpaste eruption. Don't forget to click through to this volcano frame template if you want to follow along--or feel free to build a volcano that satisfies your own craftiness! I'm a fan of coding and other computer science activities in libraries--and I hope more and more folks will be inspired in this area, too, what with President Obama requesting $4 billion in the next budget specifically for K-12 computer science (CS) education. I love that coding activities are simultaneously versatile and engaging. Also, there's some indication that those activities kids intentionally spend time on are the ones preparing them for future jobs we have yet to even imagine. That's a strong argument for making sure CS and coding are part of library offerings, if you ask me. In my relatively short career thus far, I've had the opportunity to work in libraries with both limited and advanced tech materials when it comes to kids' programming. What hardware a library has access to certainly factors into what type of computer science programming they can offer, but hardware doesn't have to be correlated with your intent to program around coding. 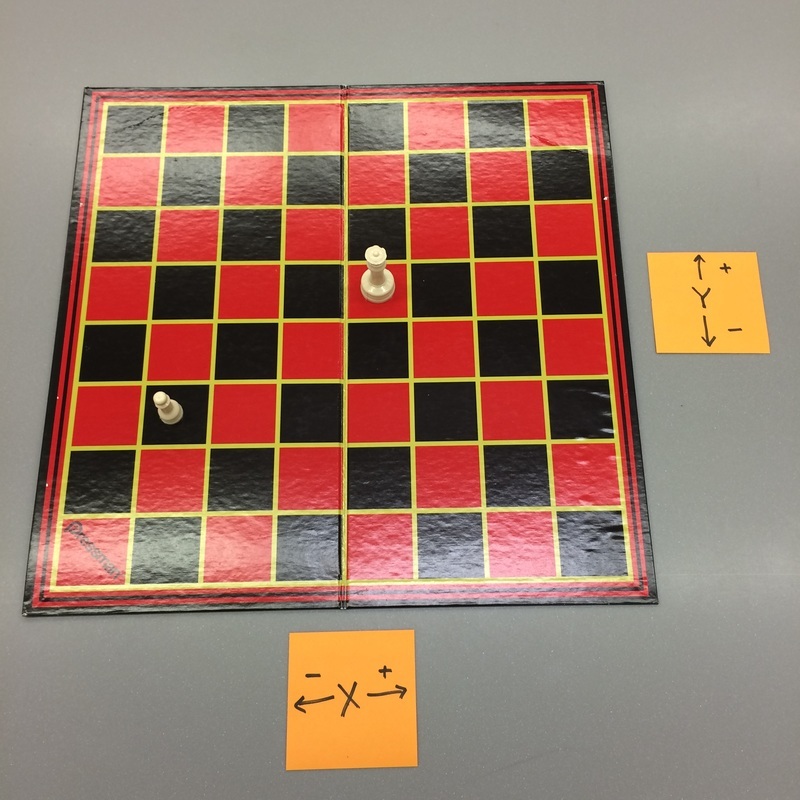 We can get kids started with fundamental coding concepts in plenty of no- and low-tech ways. tokens, and blank index cards. 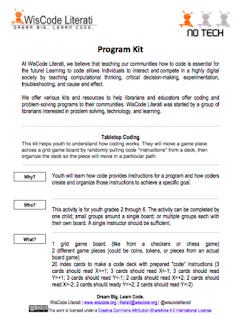 With that in mind, I put together a Tabletop Coding activity for elementary ages and older. I've offered it as one of a range of stations on our Afternoon of Code here at Skokie, but it can also be a standalone pop-up activity, a competitive program--you name it. 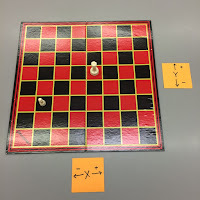 The materials are simple: a gridded game board, like for chess or checkers; a few game pieces or other tokens; and 20+ blank index cards, plus a writing utensil. With these simple materials at your fingertips, you can get kids in the mindset for coding. Full details on running the activity are here. You see, rather than specifically share this full program activity how-to here on the blog, I wrote it up for a tremendous, free coding resource made by and for librarians: WisCode Literati. Their website hosts a growing number of CS activities, called "kits," that cover the full spectrum from no-tech to high-tech activities. Basically, there's something there for every library to offer, regardless of the tech you have at your disposal. Each activity has a thorough description, most often with helpful pictures, to get library staffers at a point where their comfort level matches their enthusiasm for offering coding activities. 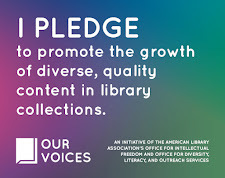 You should check out all of the great program and activity ideas, all of which have been vetted by librarians. What are some of your favorite coding resources?